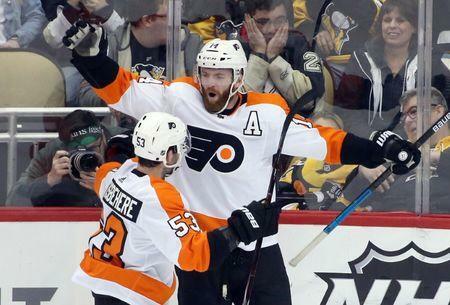 Sean Couturier scored with 3.4 seconds left in overtime Sunday to give the visiting Philadelphia Flyers a critical 2-1 win over the Pittsburgh Penguins . Couturier's 29th goal came when he blasted the puck from the right circle to the far side past goaltender Matt Murray, who also gave up James van Riemsdyk 's tying goal with 18.8 seconds left in regulation. Flyers goalie Carter Hart , in just his second start in 11 games, made 41 saves. The game was played 16,000 days after Philadelphia (35-29-8, 78 points) last won the Stanley Cup in 1975, and the two points helped keep the Flyers' playoff hopes alive. They are six points out of an Eastern Conference wild-card spot with 10 games to play. Zach Parise and Jared Spurgeon scored for Minnesota, which lost for the fourth time in its past five games. Goalie Alex Stalock , making just his second start in the past 14 games, stopped 17 of 20 shots. Ryan Nugent-Hopkins , Leon Draisaitl and Kris Russell scored goals, and Connor McDavid had two assists for Edmonton (32-33-7, 71 points), which remained seven points out of the second wild card in the Western Conference. It was the eighth straight multi-point game for McDavid, who now has 105 points this season. Buffalo captain Jack Eichel and St. Louis forward Tyler Bozak each scored in the first round of the shootout. Reinhart's bid banked off Jake Allen's glove and into the net to set the stage for former Sabres forward Ryan O'Reilly, whose shot deflected off the crossbar to end the game. Josh Leivo's goal in the fourth round of the shootout lifted visiting Vancouver past Dallas.